For once my new find is not an item thought lost which I discovered by a focused search. This time I caught hold of it by going through library catalogues and finding an item unknown to me. Coincidentally, the item was found in the same library as where I found the missing Six Duos by Pietro Denis. The volume is preserved in Yale University Library (Misc. Ms. 491). Yale bought the item from Colin Coleman with income from the Friedman fund. As this volume of mandolin music was previously unknown, there is a lot of information to be looked at. Let’s first describe the volume itself. It’s quite a substantial collection of music as it entails no less than 53 pages (and quite a lot of music on it). As usual the paper is a slightly bigger size than the A4 or letter formats in use today. The music pages are all in manuscript. The title and dedication pages are printed, a combination not often found. There are some typos in the title page which seem to suggest that the person typesetting wasn’t familiar with the language or subject and that this wasn’t proofread. It may also be a later addition or replacement of an earlier manuscript version, but from looking at the volume it seems to match the paper type quite well, and was likely originally bound together with the manuscript music. The volume is placed in Aix (en-Provence) and dated 1775. I have found no conflicting facts, rather the opposite: the dedicatee indeed was in Aix in 1774-1775. More about that after the dedication page. di benevolenza dell’E. V., e di mia riconoscenza. The dedicatee’s name and title (or rather of his father) is full of typos. The person in question is Algernon Percy (1750-1830), the son of the Duke of Northumberland. He was elected as MP for Northumberland from 1774 on. Lord Algernon became a Peer by inheriting the barony of Lovaine from his father in 1786 and left the Commons from that point. However, prior to the start of his political career he seems to have suffered from some illness and was sent to the south of France on doctor’s orders. He seems to have spent at least some time from 1773 in the south of France on. Even during the elections in 1774 he remained in the South of France and had to apply for election in writing and let his father manage the campaign. An interesting anecdote is that he met his later wife during this trip abroad (Susan Isabella Burrell), who was travelling alongside her father. Shortly afterwards, in 1775, they married. As announced on the title page, there are duets, aria’s and sonatas. However, the aria’s seem to be interspersed into the duets (not uncommon in mandolin duets). So in fact, there are six duets containing arias in themselves, followed by six single-movement sonatas. The style is rather fashionable and I’m expecting these will be enjoyed by other mandolin players as much as I enjoyed them. Though not for beginners, the duets can be mastered by most advanced players. The sonatas are a bit more taxing but are lots of fun as well. Again I have created editions of this work, available for free. Please note that my research and creating of these editions costs time, money and effort so if you like my work, donations are appreciated. Below you can find links towards the Urtext and modern editions of all duets (containing the aria’s as in the original) and sonatas. In the course of my research into mandolin prints prior to 1850, I have tried to find some of the volumes thought lost. High on my list was the volume Six Duos Pour Deux Mandolines by Pietro Denis printed in Paris in 1764. It’s the first print in Paris to list the mandolin first on its title page. I have been able to find a copy in the music library of Yale University (M293 D395 D9++ Folio). The genre of duets was one of the most popular in the Paris prints from 1760-1780. It may even be considered that some of the mandolin solo sonatas with bass were played with a viola or a second mandolin (see research by Didier Le Roux, and some pointers in the Leone Variations print (see blog post) and Barbella print by Verdone, and many other clues). The volume by Denis is one of the earliest mandolin prints from Paris. Very few volumes predate Denis’ bundle. The first one is the duets bundle of Leone, but this one rather mentions the mandolin as an alternative to the violin at its title page. Denis is much bolder in his advertisement towards the mandolin (even though Leone’s duets might have been meant for mandolin). There is another volume of duets by Giacomo Merchi from ca. 1758, which predates both, but only later on re-marketed itself as mandolin duets. This volume was likely originally meant as mandolin duets, published as violin duets, and when the mandolin became popular in Paris, re marketed towards the mandolin. The fact that it’s a unique item for its time, predating the popularity of mandolin duets and the numerous prints which were to follow, merits the attention of any mandolin scholar or player. Pietro Denis (Pierre Denis) was active in Paris from at least 1760 until at least 1775, and most of that time he advertised as mandolin teacher and his mandolin prints. He even published a mandolin method in three parts (1768, 1769 & 1773). This method (or at least volume 1) was criticized by Leone and Denis altered some parts of his method in volume 2 (after Leone’s own method and its criticism was published). Denis’ music for mandolin contains both instrumental pieces as well as a huge collection of vocal pieces, mostly based on contemporary arias from the Comédie Italienne. He also printed a few theoretical treatises, such as translations to French from volumes by Tartini and Fux. These translations and his attempt at a guide to musical composition come at the end of his output, and seem to indicate that he started to try to earn a living in other musical areas than the mandolin. That might well be prompted by a decline of interest in the mandolin. Some of his volumes got reprinted in the 1780s but it is unclear if Denis was still involved. His output shows at the one end some musical education and understanding of musical composition and mandolin techniques. At the other end however, it’s also clear that this experience was limited and somewhat flawed (see contemporary and later criticism towards his translations, mandolin method etc). It has been suggested Denis background might be from the provinces and/or a lower class which might explain some of his limitations. Though this is no more than a likely hypothesis (still to be proven for sure), opposite this view the fact remains that Pietro Denis is one of the most important teachers and publishers for the mandolin in Paris in the 1760s and 1770s. NB: Someone with the same last name (Denis) (re)printed some volumes in the 1740s in Paris, but these are not by Pietro Denis. One is still often wrongly attributes towards Pietro Denis, and can cause some confusion (Nouvelle methode pour apprende en peu de tems la musique et l’art de chanter). Of this prolific output of prints, most are preserved. The missing items are marked with strikethrough. Dingli’s 1767 version of the Sei Sonate seems not to have survived, but it may well be the same set as printed in 1769. The 4th set of vocal tunes with mandolin accompaniment also seems to have been lost, as well as the first of the IV Saisons Européennes (there are no clues whether the 3rd and 4th volumes ever were printed). So far, the Six Duos, his first volume of music for mandolin, were also thought lost. Et les deux derniers sur la Vielle et Musette. chez le M.d de Vin. Et aux adresses de Musiques. An interesting point is the fact that Echaud is mentioned, someone known from other sources but from whom no musical output survives. That he contributed (even if only as editor) is an interesting point. Apparently Denis wasn’t as accomplished yet to venture into printing on his own, as he would do later on. It’s of course also possible he included a teacher as a courtesy, but somewhat unlikely. It is quite possible that Denis wasn’t yet able to publish on his own and needed some further help (either financially, in organizing the print or musical). Auprès des Etats Généraux des Provinces Unies. Though not a very detailed dedication and not as florid in language as some contemporary dedications, it is an interesting one. It seems to suggest some contact between Denis and his dedicatee. More importantly, this seems to have been during his stay in Naples – a possible line of inquire into Denis’ background and stay in Naples. At least we can now date his travels before this print (1764), and unless he went back the references he makes in the mandolin method also predate the Six Duos. The volume contains six duets of three movements. The last two are claimed to be suitable for musette or vielle à roue which actually shows up in the musical style. It’s of course meant as a commercial gesture to try and achieve more sales. But the music shows that the composer takes into consideration the specifics of these instruments (range, bourdon). Those not familiar with the musette or vielle à roue should certainly take some time to read up. Both instruments were part of the Paris late baroque – early classical music life and some prints were targeting them (sometimes both instruments). The duets are not yet in the fully developed sonata form, and are a bit reminiscent of the baroque sonata form. Often there is a subdominant reprise which transforms to the tonica key at the point of the dominant modulation of the original exposition. Thought certain elements could be considered ‘Italian’ in style, the galant style of writing is not yet fully employed in these pieces. It’s certainly not a late-baroque French set of pieces but more something of a transient between the baroque and classical styles and something with Italian influences when this was still a novelty in Paris. As usual I have put in an effort to make this unknown part of the mandolin repertory available to the community. I’ve used my usual approach: an urtext edition and modern editions. The urtext edition is true to the original and only puts in place some corrections (which are listed and often even visible in the score). Due to the bigger paper size I had to make one adjustment: the urtext editions are in landscape (so we could still put the same amount of bars on the staves without minimizing the size of the print too much). Rather than one big edition of the full set of duets, I’ve split them up per duet. The modern edition is aimed at today’s players and has a more usable and modern layout and includes parts besides the score. I’d like to express my thanks to Yale University Library (especially Suzanne Lovejoy) for the permission to create these editions. As always these editions are free. If you would like to show appreciation for my research and the effort I put into the editions, you can contribute via the donate button. One of the so far unknown items in Yaler university library is a manuscript by an unkown composer with the name of Matteo Fiorito. It is a substantial volume but mainly solo repertory from the late 18th century, and likely had didactic purposes. This blog post describes the content of the manuscript. I have not yet found the time to issue editions (though I have the permission to pursue such editions) but will create them when I find some time (some other editions with more priority needed finishing first). (See also the article about Yale University library, and the other important finds like Denis’ duets and Palesi’s Divertimenti). I’ve had a quick glimpse to find out more about the composer and the lady who seems to have owned the booklet. Both so far have eluded me, but this type of research isn’t very easy as in the 18th century there are only a limited amount of archives. The only link to place the item is the name “Morsasco” under the addressee Giulia Boccaccio, in a letter included in the volume. This might imply that the lady at least at the time of the letter (1802) was living in Morsasco (Piedmont, Italy). This however doesn’t prove that the source is connected to Morsasco until we have proof the family of Giulia Boccaccio had a residence there. Possibly Giulia Boccaccio is the person listed in the Italian archives with a birth in Mantova in 1738, married to Giuseppe Rossini and died in Mantova (1808). Without further confirmation this remains unsure. It would mean that the volume was created (and mandolin classes received) at the very end of her life, which is unusual (normally music education is for young ladies prior to marriage). As Morsasco and Mantova are not too distant this lead isn’t entirely impossible, but we’ll need further evidence before we can call the lead promising. The online archives don’t show a very likely candidate for either Matteo Fiorito, though there is one Matteo Fiorito married to Santa Bagagiaro whose daughter died in Agrigento in 1841. As Agrigento is on Sicily, this seems a bit unlikely to be where we have to find Fiorito as the other sources are from the mainland. The volume itself has a date on the cover. However, it is adapted. It first read 1766 and was later corrected to read 1796. The letter (from 1802) as well as music from after 1780 seems to imply that the corrected date is the right one for the creation of the volume. The volume bears a some signs of didactic purposes. A lot of the music seems to be a rendering for solo mandolin of popular music, and the last page has a list of lessons and a receipt of selling strings. This would imply Matteo Fiorito was hired as a teacher and this volume was created to feature in his classes. The name of the composer or teacher is only mentioned once. Matteo Fiorito is clearly written though the “t” is missing a stripe. However, as some other lines in the same handwriting have a distinctly different shape for the “l” and another “t” missed a stripe, we’ll assume the name is indeed “Fiorito”. Letter to Giulia Boccaccio, dated 1802 and addressed to her in Morsasco. “di Matteo Fiorilo” seems to have been written at another time or in a different hand than the rest of the title page. It is the same hand than other parts in the book and the proof of the title page, so I would suggest that the top part might be written by someone else (Giulia Boccaccio herself, or someone in her household?). On the remaining pages there is a list of number preceded by “Lezioni” (so likely a list which was kept to track of the lessons. (Perhaps to keep track for payment, in that case it seems payment was per 20 lessons as 3 times 20 lessons are listed.) Under this list, on the same page, is a list of prices for strings which is likely an addition for strings received. Most teachers also sold instruments and strings, and to have this on a page which seems to have been there to keep track of payment of classes given, reinforces the feel that the booklet is for didactic purposes. The prices on the list were corrected here and there so seems to have been a hasty addition or receipt or something of the sort. The next page has a few words of the title page of the booklet. (“Divertimenti a Mandolino di Madamigella” is all which is listed.) Seems a proof of the title page. The music is undoubtedly meant for someone learning to play the mandolin, and has quite a number of easy tunes. There is only one part which has a bass, all the rest is solo. The music seems to have been a collection of popular tunes used for didactic purposes (learning to play or learning how to better play the mandolin). The pieces don’t have the finished feel of real compositions for mandolin, though the occasional Sinfonia and Sonata are slightly better quality. The manuscript hence doesn’t have the most interesting or creative music for mandolin, but it’s one of the few sources which shed light on mandolin education in Italy in the late 18th century. Maybe when we will find out more about Giulia Boccaccio or Matteo Fiorito, we’ll progress further on the background of the how and why this manuscript was created. As I have so many more interesting volumes to process, I have given priority to deliver editions of others over this volume. I will normally revisit the volume, research and will issue editions once I finish with the other editions. As most readers will know, I pursue primary source research into mandolin history and have done so with a focus on mandolin related prints prior to 1850. During my research I occasionally stumble upon either new finds in libraries already researched by other mandolin scholars. Sometimes, I also have the privilege of being the first mandolin scholar to get a view on mandolin related sources from a library previously not visited by mandolin scholars. Yale University library is one such location which so far went under the radar, and that is totally undeserved as there are many astonishing sources I discovered at this beautiful institution. The library has a historical pedigree not to be sniffed at. It’s one of the few North-American university libraries with a rich history going back to the 17th century. However, it is not the distinguished history of the library which caused it its current pile of mandolin sources. In fact, it appears that most of the astonishing mandolin-related historical sources were only recently purchased (last 20-30 years), funded by donations. This does not diminish in any way the achievement of Yale University library to collect and preserve historical sources. Rather, it shows that there are still some interesting manuscripts and prints coming on the market and that it’s important for public institutions to attract enough funds to collect these. Santo Lapis Miss Mayer, a new guittar book in 4 parts London 1759 M1621.3 L313 op.16++ Folio Purchased from J & J Lubrano with income from the Rose Jackson Fund. Pietro Denis Six duos pour deux mandolines Paris 1764 M293 D395 D9++ Folio Purchased from Otto Haas with income from the Rose Jackson fund. Gabriele Leone Méthode raisonée pour passer du violon à la mandoline Paris 1768 MT602 L583 M5 1773+ Oversize Purchased from Lisa Cox with income from the Kirkpatrick Fund. Pietro Denis Seconde partie de la methode Paris 1769 MT608 D395+ Oversize Gift of the Friends of Music at Yale University, 1967. Constantino Palesi Divertimenti di cammera per due mandolini Aix 1775 Misc. Ms. 491 Purchased from Colin Coleman with income from the Friedman fund. Matteo Fiorilo (Fiorito?) Musica di Giulia Boccaccio – Divertimenti a mandolino Morsarsco? 1796 Misc. Ms. 601 Purchased from J & J Lubrano in 2009 with income from the Margaret Deakers Waith Fund. The methods of Pietro Denis and Gabriele Leone are among the most well-known mandolin sources from the 18th century. Both are available through facsimile editions and are preserved in several other libraries (and Leone is even available on IMSLP). These two prints are hence not a new find, though they of course have merit. Everyone not familiar with them should certainly pursue to study them – these two are by far the most well-spread mandolin methods of the 18th century. The item by Fiorito is a manuscript with solo mandolin music, likely written for didactic purposes. I’ve published a blog article about it, listing its contents and some remarks. Likely I will later on update with urtext and modern editions (but at the moment these were not yet finished as I had many others with higher priority to finish – such as the editions of the sources listed below). A second interesting item was already on the list of mandolin scholars: through advertisements we already knew Pietro Denis published a volume of duets in Paris in 1764. No preserved copy had been found until now. I have published a blog article on this item. It includes my urtext and modern editions of the music in question. It’s an interesting volume, and one of the early witnesses of the golden decades of the mandolin in Paris in the 1760s and 1770s. The Divertimenti by Palesi are a find of a bigger magnitude than the volume by Denis. Both in quantity and quality this volume surpasses the duets of Denis. It also increases our knowledge about the mandolin in the South of France and adds some new composer to the ever increasing list of mandolin composers. This item also has its own blog post, and also includes urtext and modern editions. Yale University library is a so far ignored treasure trove for mandolin scholars. Though some of the mandolin sources are known items, there are also some yet unknown sources which add to our knowledge of mandolin history as well as the historical repertory of the mandolin. With the Year-end in sight, I wanted to share some minor discoveries I don’t consider important enough to warrant a separate blog post. At the same time, I can’t resist lifting some part of the veil of what is coming up in 2019. Straube’s English guittar (a type of cittern) book contains two songs by Gervasio. Most likely these were originally songs with mandolin accompaniment. Gervasio used to perform on concerts with his wife (a singer) and his books of Airs contains some songs in a very similar style. Of course, Straube’s version is adapted to fit the English guittar. These are of importance because it is active proof of interchange of repertory between the English guittar and mandolin. There are quite a few other British sources who bear out the link between these two instruments. Though the first book is already well-known (Anonymous (“Composed by an African”), Minuets, Cotillons & Country Dances, London, ? (ca. 1775)), a second book seems to have gone unnoticed. This second book was also “for the Violin, Mandolin, German Flute & Harpsichord”. It is preserved at the British Library. The title is “Minuets &c &c Book 2nd”. I have been able to date one of the Colizzi prints. The Airs Choisis can be dated through an advertisement (‘s Gravenhaagse Courant, 22/01/1776). Likely the concerto was from around the same date (ca. 1776). Furthermore, there are some indications as to which mandolin player might have inspired Colizzi. Several advertisements announce the presence of the Gervasio couple performing concerts in Amsterdam and Rotterdam in the 1776 and 1777 (Amsterdamse Courant, Rotterdamse Courant 1776-1777). In Amsterdam, the tickets for the concerts were sold in the shop of Hummel, who also sold the prints by Colizzi. It’s only indirect evidence, but it seems a logical explanation of the facts which have come to light. Several sources confirm that a certain Nonnini published a print of Italian songs. There are both French and British sources, so it is a bit uncertain whether there were a French and/or a British (re)print, and which of these might have been earlier than the other. However, when looking at the facts currently known, it might be the case only one London print was made. Only a London print of this volume is preserved (in the Museo internazionale e biblioteca della musica di Bologna, Italy). Interesting though is that this item also has a French additional part put on top of its frontispiece. This seems to suggest the London edition was also sold in Paris, and maybe there never was a separate Paris (re)print. Whatever the circumstances and possible editions or re-editions, another fact which needs to be considered, is the instrumentation. The English print mentions “guitar”, but that word in this context means almost surely the English guittar, a cittern type linked with the mandolin in several other prints. Again an example of a French opera print, and of one with a most famous mandolin aria (Saper Bramate). Interestingly enough the translation was made by Nicolas-Étienne Framery, who also printed several mandolin pieces when he was editor of the Journal de Musique (in 1770). Framery is one of the famous advocates of Italian music (vocal as well as instrumental), which seems to once more confirm the relation between the 18th century French musical Italophiles and the mandolin. Na Real Fabrica, e Impresão de Musica no largo de Jesus se estampou ultimamente huma Sonata nova para o Mandolino, composta por João da Mata de Freitas. Aria Il mio-Ben dell’Opera de Nina cantando pelo Caporaline, com acompanhamento de Cravo, arranjado por P.A. Marchal: e las Variações de Marlborough para Mandolino ou Flauta, com acompanhamento de Violino e Basso, as quaes obras se achão na Real Impressão de Musica de P.A. Marchal, no largo de Jesus. Unfortunately, both of these prints seem not have been preserved. But it is interesting to spot some prints for mandolin in Lisbon. Some manuscript sources, such as the variations by David Perez for the royal princesses, or the quartet by Totti, show some mandolin activity at the royal court. This means Lisbon can certainly be shown to have been an active center of mandolin activity at the end of the 18th century. Though usually not mentioned, it makes sense that the early Mozart prints around the turn of the 19th century (by Breitkopf), also included some of his mandolin music. The earliest print of Don Giovanni includes the mandolin aria, and the earliest print of songs with piano accompaniment also include one of the mandolin songs. Though this is not an important discovery, it is at least another fact to add to our knowledge of mandolin-related prints prior to 1850. A very interesting find is the volume by Bortolazzi printed during his stay in London: Bortolazzi, XII Favorite Waltzes & Trios, London, ? (ca. 1802). This is a print made for keyboard (“piano forte”) but based on pieces “as Performed by the Author on the Mandolino Before Her Majesty & the Royal Family”. This statement of performing for the royal family and the dedication to “H.R.H. the Duchess of York” was of course part of the marketing of the print. It is quite easy to make out the original based on the adaptation for keyboard: the right hand is obviously the mandolin part, and the left hand could usually be played easily by guitar, as was Bortolazzi’s usual instrumentation. It is possible I will publish a modern and urtext edition in 2019. It is possible I will attempt a modern and urtext edition in 2019. Leone, Six sonates, Paris, 1767, 2nd edition Paris, 1768: blog post and modern + urtext editions about the 2nd edition which has “Marquées des signes suivant la Nouvelle Methode” instead of the first edition version “Arrangées au mieux pour le Violon”. Gervasio, Airs, Paris, ? (ca. 1768): blog post and modern + urtext editions. Aichelbourg, Pot-pourri concertante (opus 1), Vienna, 1812: blog post and maybe later editions. As I’m currently mostly busy correcting a paper version of the presentation I delivered at the symposium “Toleranz und Intoleranz in der Musik – dargestellt am Beispiel der Zupfmusik” at Mainz University in May 2018, I will likely also put in a blog post when this article is published. The title of my presentation was “Tolerance between instrumental repertories or commercial tricks?”. Most of the mandolin-related prints prior to 1850, even those that are not preserved, are known to mandolin scholars through contemporary advertisements. Sometimes items still emerge which have escaped attention so far. The volume I have found and will discuss in this post is by the composer Michele Bolaffi and was printed in Firenze during the last decade of the 18th century. It is preserved in the Royal Danish Library (shelf mark MAlæs-B324 mu 1306.2700). Most 18th century mandolin sonatas are written in the fashion of solo sonatas with a bass (usually unfigured). The big bulk of mandolin prints published in Paris are all part of this tradition. We’re not entirely sure how these bass lines were performed. Harpsichord seems the obvious choice, but some evidence suggests that the bass line is sometimes played without figuration, and possibly an octave higher (see for example the plectrum signs on Leone’s bass line of his variations – discussed in the blog post of my discovery of the variations, as well as the remarks on the title page of the Verdone edition of Barbella mandolin triosonatas). Only at the end of the century the first examples emerge which use a fully written out part for keyboard which at least cause less confusion about the originally intended ensemble. Alas, only a few of these were preserved prior to 1850, and even fewer are from the late classical era. A fine example which has some bearing on the volume by Bolaffi was already discussed by Paul Sparks in The Early Mandolin (Paul Sparks, The Early Mandolin (Early Music Series 9), Oxford, 1989, p. 135, 157, 166, 168-9). It is the Suonata Decimaquarta by Vincenzo Panerai (for “Cimbalo a piano-forte e Mandolino o Violino obbligato”). This rather short sonata was published in Firenze. The date given in The Early Mandolin is only approximate (“ca. 1780”). With a little digging I have retrieved an advertisement for this print from 1790 (See Gazetta Universale, o sieno notizie istorice, politiche, di scienze, arti agricoltura, ec, nr. 67, August 1790, p. 536.). Dating the piece by Bolaffi is not as straight forward as I have yet to retrieve any advertisement (NB: see update below for the exact date). However, some secondary information helps to narrow down the date a little bit. First of all, the editor Pagani only started printing music around 1789 (I have not found any earlier music though he was a very active printer of literary books prior to music). I haven’t found clear and corroborated details about when Pagani, or at least Anton Giuseppe, might have died (it seems some confusion arises with Giovacchino Pagani who worked together with Anton Giuseppe and continued the business). Based on prints available in library catalogues, it appears that Anton Giuseppe might have lived until 1798. There are also a few correspondences between Bolaffi and Panerai’s sonatas which help reinforce the dating to 1789-98. Both were engraved by the same person (Giuseppe Poggiali). And though the sonata of Panerai only mentions Rinaldo Bonini as editor or sales point, some other sonatas by Panerai mention Anton Giuseppe Pagani. The dedication is not exactly the same, but there is some similarity. The Panerai print is dedicated to a specific Florentine lady, and the Bolaffi print is dedicated to all Florentine music amateurs ladies . Granted, these are all just secondary sources, but they seem to confirm that the print is from the last decade of the 18th century. Hopefully one day an advertisement will surface which will help to date the print with more accuracy. It appears Michele Bolaffi was in Firenze in 1793 (composing a cantata for the opening of the new synagogue). This coincides well with our current approximate date and place of his mandolin sonata. He later on wrote and occasionally also published music, both in Italy and abroad (France, Germany, England). As held by Conway, he’s a true example of the globalization of musicians at the turn of the century. I agree but would phrase this slightly differently as there are plenty of examples from the earlier 18th century already. However, from the end of the 18th century onward musicians become more and more independent of direct patronage. Though Bolaffi still held some posts, he also seems to be an example of someone making money outside of service to a patron. In that respect, he is indeed a good example of the way musician became more independent and hence were able to become more globally active. There is a side to Bolaffi which seems to have been ignored by researchers so far. Bolaffi was active as a translator and poet . For example, in the Mercure Étranger ou Annales de la Littérature Étrangère, vol. 4, Paris, 1815, p. 141-143, there are two sonnets by Bolaffi dedicated to the memory of his then recently deceased wife. These were written at the time when he was preparing his translation to Italian of L’Enriade (Henriade) by Voltaire (which got published in Paris in 1816). An example of other work as translator is L’Immortalità dell’anima by Jacques Delille and published in 1813 (listed as printed in Venice). Hence the figure which emerges is quite faceted – someone who is both accomplished in several cultural arts and moved in higher social circles in several countries. His contribution to mandolin history is all the more interesting coming from someone who clearly had an excellent education. This clearly shows in his Suonata Prima. The sonata is a little gem, and the more I studied it, the more I took a liking to it. Though I generally try to refrain from a long and dry musicological analysis of music forms and similar approaches in my blog posts, this time I am too much in awe of Bolaffi’s creativity and had to showcase some of his craftsmanship. I will also try to compare where possible with Panerai’s work as both were printed around the same time by the same printer. The sonata is written in F major and has two movements: Allegro Moderato (in C metrum) and a Rondo Allegretto (in 2/4 metrum). Panerai also has two movements (Brillante in D major in C metrum and Allegro Scherzo in D major in 3/8). Bolaffi’s piece is quite a bit larger (11 pages of music compared to 4 by Panerai). Hence the sonata form in the first movement by Panerai is quite limited. He does use a proper recapitulation, but there isn’t a lot of room for proper development and the groups and themes are simple and contrasts are limited. Bolaffi’s groups, development and other aspects of the sonata form in the first movement are a lot more interesting. He has a very nice first part of the movement, with proper contrasts between the two groups and a nice flow towards the closing group who reminisces the first group charmingly. The development uses a lot of the typical tricks you might expect in piano sonatas by a good composer at the end of the 18th century. There is only one thing slightly out of the ordinary – the recapitulation is a bit creative. The modulation back to F major happens with a repeat of material from the second group before going back to material from the first group. In my opinion Bolaffi’s tricks work, however, as the music flow is very subtly building towards the end. The second movement is only a simple rondo, but the thematic material is rather more intricate than in most contemporary rondos. Often, the last movement in a sonata is a rondo, but usually it’s a very simple and light theme. Bolaffi is again a bit more creative and choses a very rhythmical and flourished theme. The theme does portray the typical uplifting character expected of a rondo at this time, but the rhythmic and melodic complexity are higher than usually encountered. The alternatives to the refrain are mainly focused on the dominant key (C major) but have some interesting harmonic movements which show the expertise of Bolaffi. Panerai’s second movement is not a rondo, so comparing them is a bit difficult. The mandolin is never treated very idiomatically by Bolaffi. However, there are a few indications which indicate this is originally meant for mandolin and not violin. Though playable on the violin, we’re also missing certain idiomatic figures for the violin. The fact that the music stays very limited on the fingerboard is a first clear giveaway. The composer even avoids going to the third position at the end of the first movement (where it makes sense to go up to have the theme played in the expected octave – but clearly this is avoided to not have the mandolin play in position). I’ve compared this with the treatment of the violin in Bolaffi’s Sei Canzonette del Celebre Poeta Estemporaneo (where the violin is only accompaniment). Here you can find some more violin specific figures, the music reaches the third position and has violin articulation (bows etc). Some figures of the Suonatina Prima are slightly more fitting on the mandolin and/or might sound better (due to chordic playing). Though I am very much aware of the big exchange of repertory and other links between the violin and mandolin in the 18th century (see my paper on that from the symposium at Mainz university – to be published later), the above suggests that the music by Bolaffi was originally intended for the mandolin. The violin seems to be mentioned mainly as a commercial trick. In contrast, Panerai doesn’t refrain from using the third position in his mandolin sonata. But his music also seems originally intended for mandolin rather than violin for the same reason of missing violin idiomatic writing. Panerai has a tendency to focus on exchanging themes between the mandolin and right hand of the piano. Often this is in a predictable pattern. Bolaffi also exchanges some themes between mandolin and right hand of the piano but he’s less predictable and more original. Though Bolaffi is not a Mozart or Beethoven, he’s certainly a level above Panerai in making the composition more interesting and fun for the musicians as well. The way he switches from one group to another shows he understands how to build up tension and he uses some piano idiomatic techniques very suited to certain transitional passages (for example the switch in bars 17-18 from group 1 to 2 or in the development bars 51-53 to build up to the development of parts of group 1). Bolaffi also shows how to drive the music forward or building up tension, for example by condensing or slowing the rhythm. All in all, Bolaffi shows his mastery as a composer and of the sonata. His treatment of the mandolin could have been more idiomatic, but as he is clearly aiming at amateurs he could not aim at a technical high level. I can only conclude his piece is very well written within the given context. It’s also unique as it’s one of the few classical mandolin-piano sonatas which survive. No doubt some students and professional musicians will take this up in their repertory as the music is rather charming. It’s certainly worth considering playing from the originals. However, the landscape layout, bigger paper size, some older layout, omissions and a mistake compelled me to create my usual urtext and modern editions. The urtext editions remains true but put in place corrections. The modern edition has a modern layout and adds a score as well as partbooks. I tried to make the modern edition a playable layout, though you will still require three pages next to each other (but in my experience that should still fit a normal music stand). As always these editions are free. If you would like to show appreciation for my research and the effort I put into the editions, you can contribute via the donate button. Gerber (Neues Historisches-biografisches Lexicon der Tonkunstler, v. 4, 1814, p. 651) already lists the date of the print as 1801. Paul Sparks seems to have had a different source as he only has an approximate date of ca. 1810. Before I found the exact date of 1801 mentioned in the lexicons and Janssens, I already suspected this to be slightly too recent. Eder changed the name of his company so it was already dated with certainty before 1811. It also seems that Zucconi published first at Eder and later on switched to Cappi. That also leads to the conclusion that the variations would date closer to the turn of the century. After some further research I have found corroboration from the Allgemeine Musikalische Zeitung. The third year of this famous magazine, from 1801, lists on p. 675 “de Zucconi, 6 Variations pour la Guitarre et Violon ou Mandoline. 8 Gr.”. Zucconi’s print hence predates the other mandolin(/violin) and guitar prints from Leipzig and Vienna (like those from Bortolazzi, von Call and Aichelbourg). None of the other scholars seems to have found a preserved item, but a few years ago I saw one listed in the Stadtbibliothek Lübeck. I am indebted to the library staff for their help, especially Arndt Schnoor. I’m also very grateful for the library’s permission to publish this item. All of these seem to have been printed from 1801 until 1805. We can easily deduce that Zucconi was one of the champions of the guitar in Vienna around the turn of the century. The print contains a theme, six variations and finishes off with a Piu mosso. Most movements are written with dal segno signs to compress the music a bit (as printing is still expensive all space saved is welcome). The keys used are limited. C major is used in all cases except for variation 4 (“minore” in C minor). The metrum is almost always 2/4, except for variation 6 and the first part of the Piu mosso (3/4). Though the music has interesting parts for both musicians, the guitar is more often used for accompaniment and the mandolin(/violin) plays the melody most often. The mandolin(/violin) is favoured in the theme and variations 2, 4 and 6 and in the first part of the Piu mosso. The guitar features heavily in variation 1 and the second part of the Piu mosso. An interchange between both instruments happens in variations 3 and 5. The music is slightly more creative in terms of composition than a lot of the variations sequences for mandolin(/violin) and guitar. Undoubtedly the volume is meant only as entertainment music. Even though it can’t compete with some of the output of the better known composers, Zucconi’s sequence deserves a place on the stage. Comparing with von Call, Bortolazzi and Aichelbourg is difficult, as the style of writing is different. But to my mind, his take on the genre of variations is interesting and the way he sometimes intertwines the mandolin(/violin) and guitar is well done. The music is not very idiomatic for mandolin. But we’re also missing any idiomatic writing for the violin. The lack of higher positions, sustained notes and typical violin accompaniment figures shows us more about the intended instrument than the lack of typical mandolin figures. Most likely the violin is only mentioned for commercial purposes. Another contemporary example which shows this clearly is Bortolazzi’s op. 8 from 1804. This volume lists the violin on the title page, but the cloak is thrown off in the partbook, which only mentions the mandolin. The fact that the print is dedicated to a teacher shows that music printing has now become mature. No longer do all musicians need a huge patronage in order to publish music (though it still occurred, of course). Without checking each mandolin-related print in detail, I believe this is one of the earliest mandolin-related prints without dedication to a patron. With the kind permission of the Stadtbibliothek Lübeck (for which I’m very grateful) I’ve created an urtext and modern edition. The urtext edition remains true to the original, even to the point of having the same bars and notes per staff. However, because of the difference in paper size I couldn’t put the same amount of staves on a page. I also had to resort to using a landscape layout to keep the note size readable enough. I have corrected a few things (mainly some missing accidentals), which are listed on the last page, but usually also clearly marked in the score. The modern edition has a normal modern layout and makes it a lot easier to read the music. The original compressed the music by using dal segno signs in a slightly awkward way which might confuse today’s musicians. My rendition puts the most likely interpretation on paper. Besides a score the modern edition also comprises of two parts, mandolin(/violin) and guitar. As announced on the previous blog post, there is yet another music print related to the mandolin from Great Britain from the 1750s. The volume is called Miss Mayer and is by the Italian composer Santo Lapis. Together with the Oswald’s Eighteen Divertimentoes and Walsh’s Forty Select Duets we now have a lot of extra information and repertoire available. Same as with the print by Walsh I would need to apply and pay for a license to publish an edition. In reaction to my previous post about Walsh’s Forty Select Duets, John Goodin did point out that I might apply for a CMSA grant to get the music published. Depending on the outcome of that or enough donations arriving, I will however have to limit this post to describing the volume. The print is catalogued by RISM in Series A/I as L 667 and is printed in London in 1759. The current RISM entry doesn’t mention the mandolin but it is a clear omission, likely due to the fact that the mandolin is only mentioned later on the title page. The item is preserved in the British Library with shelf mark Music Collections G.809.c.(16.). in Compton Street St. Ann’s Soho. Besides the title page there are 20 pages. There are four parts, as announced on the title page. First consists of six Italian songs with bass, then six in French (followed by a Vaudeville in French), third part are six English songs and lastly six duets with bass (again in Italian). There is one instrumental piece (Preludio) which is for English guittar, and during the rest of the book is it presumed that that guittar (and mandolin) can function as an alternative to the vocal part (first arietta of the first part lists “guittar con la voce”). Taking a look a the keys used, it is very obvious this book was composed or collected with the English guittar in mind. All songs are in C major, and the tuning of the English guittar is a C major open chord. Music articulation is not abundant but there are many slurs and fermatas, and occasionally an appogiatura. In some songs staccattissimo signs are used as well. Dynamics seem to be present only in the instrumental Preludio. The style of music seems to be late baroque. Some mannerisms seem out of place for its time. However, the two other guittar books from 1757 (Walsh and Oswald) are also in late baroque style. It is a contrast though with the continental sources which even in the 1750s start to link the mandolin with the preclassical style. I discussed this in some details during my presentation at the symposium Toleranz und Intoleranz in der Musik. Dargestellt am Beispiel der Zupfmusik (Tolerance and intolerance in music. Shown through examples from plucked string music) in Mainz on 8/6/2018. As this presentation will normally be published I hope to give a notification when this paper is published. The book by Santo Lapis adds again to our knowledge and repertory of the early music for mandolin. Though primarily focused on vocal music it is clear that the guittar and mandolin are not mentioned as alternatives without some thought (as proven by the C major key in all pieces). Though I will feature the link between the mandolin guittar again in some upcoming blog articles, I will turn my attention to some newly found mandolin-related prints from continental Europe first. My research on mandolin-related prints prior to 1850 turned up a couple of previously unknown prints related to the mandolin from Great Britain in the 1750s. The first source is from the well-known printer John Walsh and is from 1757. This is the same year as the already known print by James Oswald. Besides the year of publication, there are a few more similarities: the somewhat strange spelling of “mandelin” for one. Otherwise it can also be commented that the repertory is late baroque instrumental music in both volumes. This volume is preserved in the British Library with shelf mark Music Collections g.928.k. [UPDATE] I’m very grateful for the permission from the British Library for me to publish an urtext and modern edition (download see below). Dating is provided by the British Library as  which seems to suggest someone has found a secondary source confirming an exact date of print. I have however no knowledge of this secondary source, but the date does correspond with the one of the Oswald print. two German Flutes or French Horns. London Printed for & Sold by Jn.° Walsh at the Harp & Hoboy in Catherine Street in ye Strand. The 17 music pages contain scores of two parts. None of these goes below or above the range of the English guittar, the instrument for which this print seems primarily meant. Unlikely Oswald, the pieces seem to have been collected rather than originally created for the print. Four times a specific composer is mentioned (Händel): numbers 1 (Air), 2 (Minuet), 20 (Air) and 22 (Minuet). Most of the pieces are entitled “Air” (36x) or “Minuet” (5x), with one exception: number 36 is a “Pastoral” (1x). And yes, that makes a total of 42, not 40 as mentioned on the title page. Articulations used are limited: appogiaturas, tr trill signs, the occasional fermata and staccattissimo signs. Slurs are very infrequent. Most likely this volume was indeed intended for the English guittar, and the mandolin (mandelin) was an easy alternative. It might be argued that this might still or also mean the 5- or 6-course baroque Milanese mandolin. John Goodin already speculated this might be the case with Oswald’s print (J. Goodin, James Oswald and the Eighteen Divertimento’s for two Guitars or two Mandelins, Mandolin Journal, May 2003, and online at: http://www.mandotopia.com/articles/oswald1.htm). 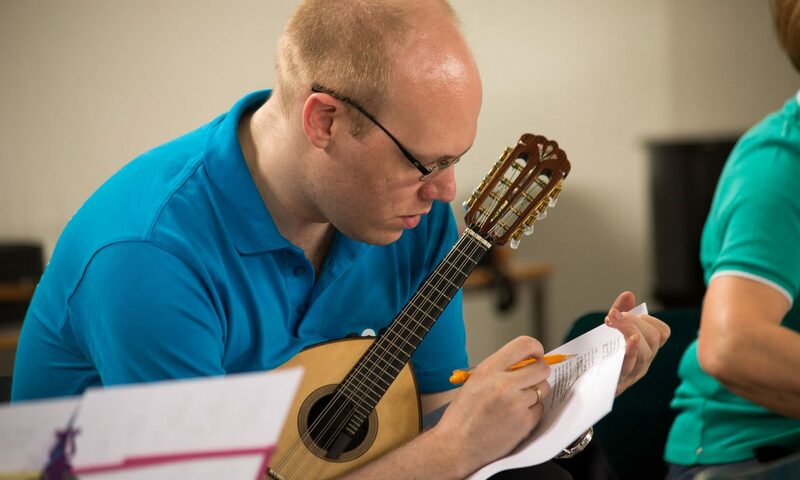 NB: Rob MacKillop has recorded the pieces by Oswald and has also took the effort to do additional research on these pieces (https://robmackillop.net/guitar/18th-century-wire-strung-guittar/). However, there is some evidence to claim the possibility that this print and Oswald’s are contemporary to the first Neapolitan mandolins in Great Britain. (See for example the portraits from the 1750s pictured in Sparks, The mandolin in Britain, 1750-1800, Early Music Journal, vol. 46, iss. 1, 4 May 2018, p. 55–66.) So we’ll have to call this inconclusive, until further sources arrive who might explain what the “mandelin” was exactly. In conclusion, the Walsh print is a fine addition to our limited sources of printed music related to the mandolin. It seems to me to have been collected and/or adapted from existing pieces rather than composed which likely is true for Oswald’s Eighteen Divertimentos. I will soon publish about another piece related to the mandolin and printed in Great Britain in the 1750s. Together with Oswald, these pieces give us fresh insights into the world of plucked strings in Great Britain in the 1750s and how this contrasts with the continental developments (on which I will comment in the next article). With the kind permission of the British Library I’ve created an urtext and modern edition. The urtext edition remains true to the original, even to the point of having the same bars and notes per staff. However, because of the difference in paper size I couldn’t put the same amount of staves on a page. I also had to resort to using a landscape layout to keep the note size readable enough. I have corrected a few things (mainly some missing accidentals), which are listed on the critical notes, but usually also clearly marked in the score. The modern edition has a normal modern layout and makes it slightly easier to read the music. The urtext edition is only a score and doesn’t take into account page turning. The modern edition has both a score (which does take into account page turns) and separate parts.